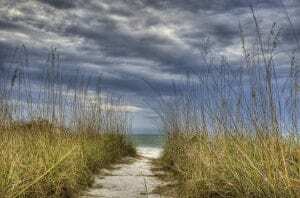 Join me, Jim Harmer, on an HDR landscape photography shoot at the beach in Florida. Unfortunately, I accidentally deleted the audio from my microphone, so I had to use the windy audio from the camera's on-board mic. Woops! In this video, I teach some compositional tricks for landscape photographers and go through an in-depth tutorial on how to process HDR photos. The entire video is only 8 minutes long, so see if you can stand to watch me for a few minutes. HDR Photography tip #1: Don't feel like you can only do a one-exposure HDR if something is moving between shots in your HDR sequence. Photomatix 4.0 has a very advanced de-ghosting tool that can often fix problems like this. HDR Photography tip #2: Photomatix doesn't show you the intermediary 32-bit HDR by default. Remember to check this box when creating the HDR (before tonemapping) so you can come back and tonemap the same .hdr file multiple times without having to start over. This way, you can use several tonemapped HDRs and blend them together in Photoshop to grab the best parts of each of the tonemapped images. HDR Photography tip #3: HDR works well on clouds when they have some detail in the clouds. If there is no detail, HDR generally won't work well. In this case, try to change your composition so the sky won't be included. Otherwise it's just a huge sheet of grey that doesn't do anything for the photo's aesthetics. Landscape photography tip #1: Use objects such as trees, buildings, or in this case sea oats to frame the sides of the photo for a stronger composition. Landscape photography tip #2: Use paths, roads, trails, fences, and other lines to guide the viewer's eye into the frame for a more compelling composition.